It's Friday and you know what that means VR and AR lovers. It's time for Field of view. The place where we get into all the happenings in the virtual and augmented worlds. We've already talked Oculus Rift S and picked out our iPhone VR headset faves, so now we're going to get into the rest of the week's news that you might have missed. Plus, we've picked out a new VR game we think you need to check out and a VR experience we think you should give a spin too after you finish reading all of this. Yes, you read that right. Sony has agreed a licensing deal with the Chinese tech company that gives it rights to use the industrial design for its own headsets. It's a two-year deal, so it's likely we'll see those PSVR-looking Lenovo headsets in the not too distant future as well. 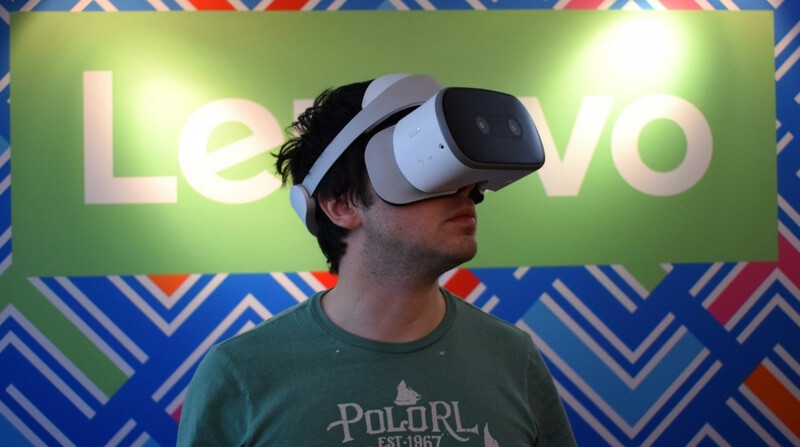 Lenovo launched its Mirage Solo earlier this year, which gave us the first Google Daydream headset that didn't need a phone to power it. Google has been awarded a patent that could be another major step in making virtual reality more immersive. The patent, which is called, 'Classifying Facial Expressions Using Eye-Tracking Cameras', relates to eye tracking camera technology that is capable of using smart algorithms to infer the expressions on their faces. The question now is whether this patent gets put to use or is just another exciting idea that never sees the light of day. We hope it's the former. The makers of the Vive have decided to join the likes of Oculus, Microsoft and Valve in the quest to ditch the many cables you need for high end VR to a solitary one. It's joined the VirtualLink consortium that aims to define the future of VR. One way the consortium wants to do that is through replacing multiple cables with a single cable that connects over USB-C. Tidy. Software support for the standalone headset continues to grow and now VR media company TARGO is the latest that wants to help you do more on the Go. It's launched a dedicated app that will give users access to original documentaries, with the promise of two new pieces added every week to the app. If VR docs are your thing, you can download it now from the Oculus Store. Okay, it's not a game, but here's a little something different that you can do with your Rift, Vive or Windows Mixed Reality headset. Developer Dance-Virtual will teach you how to move on the dance floor using your headset's accompanying motion controllers to help you get to grips with the basics. It's currently an Early Access game on Steam and will fully launch on 6 November. Now go get those hips swinging. One of the best games that launched on Google's Daydream headsets in 2017 has now made its way onto the Oculus Go and Gear VR headsets. The title from White Elk Studios is a sci-fi, first person adventure game that uses full locomotion and motion controls to explore a mysterious planet. It looks gorgeous and it will cost you just $9.99 if you want to give it a try.